HEC stands for Harsh Environment Connector by Binder and designates heavy-duty connectors for harsh environments. Primary applications are agricultural (in tractors, seeding and harvesting machines, for example). A further important outdoor field is environmental and process engineering - purification and recycling plants are good examples. Building machines and traffic and signalling technology are also typical outdoor applications. The aim was to develop a customized connection for these applications to meet sector-specific demands, in particular the stringent environmental requirements for UV resistance, insusceptibility to temperature fluctuations, resistance to acidic rain, saline mist, ozone, etc. User requirements for handling (cold, soiling, gloves) demand an absolutely simple locking mechanism and safe and secure coding. Rugged mechanics, and protection when using steam-jet cleaners must also be ensured. 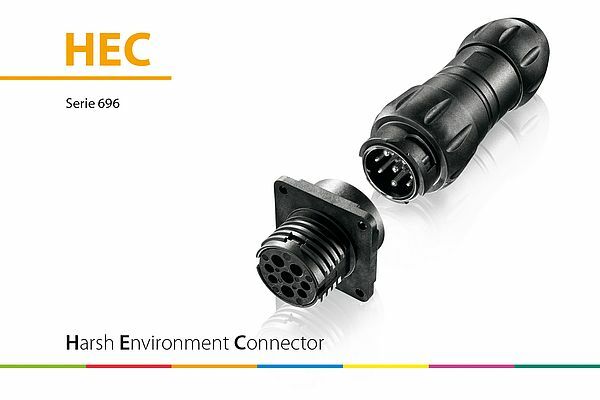 The new HEC connector meets these requirements with the features below and thus provides optimum safety: The lock is designed as 3-point bayonet catch that makes for safe and secure, fast locking, while a robust coding mechanism prevents any wrong connection. The connection technique uses a crimp design to achieve secure, vibration-proof contact. The contact arrangement for the sales launch is a hybrid 4x signal and 3+PE power configuration with a variety of cable cross-sections. The connectors satisfy the requirements for degrees of protection IP68 and IPX9K in accordance with IEC 60529 and withstand the most stringent application conditions when connected. Protection caps are also available as accessories.